Ranked 3rd in Latin America and 5th in the Americas, Mexico reported a 6.7% growth from January to October when compared to the same period in 2016. Mexico City, December 20, 2017. The Mexico Tourism Board (MTB) reported that its 2017 Meetings and Events program has led to significant growth in the industry sector, showing a 6.7% increase from January to October, when compared to the same period in 2016. 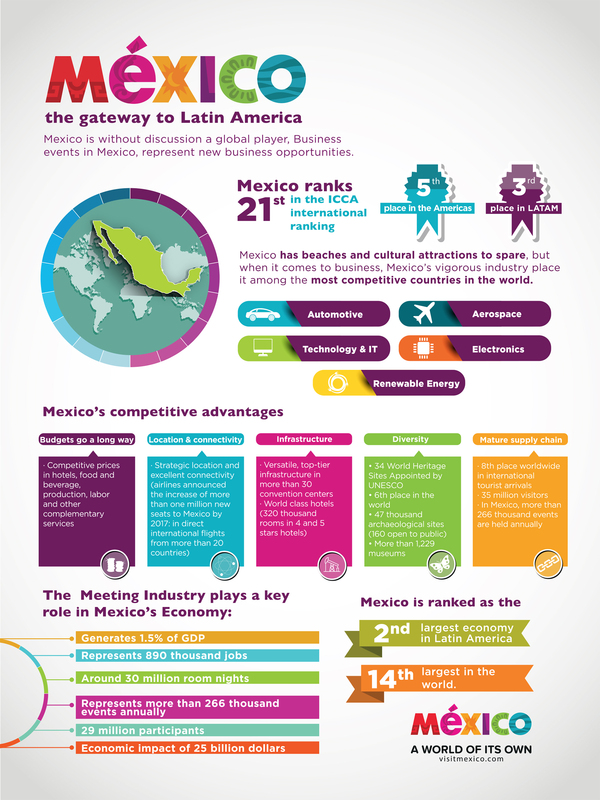 Mexico has taken a leadership position as a destination for meetings and events with the relaunch of its strategic partnership program with meetings industry organizations and initiatives that aim to elevate its ICCA ranking, as well as to increase the economic impact of the meetings and conventions industry in the Mexican economy, which currently accounts for US$25 billion. 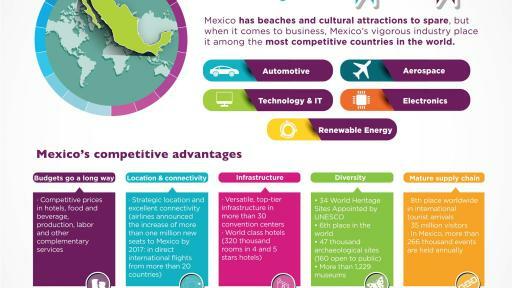 The International Congress and Convention Association (ICCA) ranks Mexico as 3rd in Latin America, 5th in the Americas, and 21st globally for meeting and incentive travel. To continue strengthening its position as a top destination for hosting international business events, the Mexico Tourism Board launched a dedicated Meetings and Events plan this year. The implementation of these programs has had a significant positive impact in the industry and in Mexico’s strategic approach to growing this important sector. The National Ambassador Program, consisting of 90 scientific, professional and trade leaders from Mexico with global influence, that resulted in securing important events such as the 14th International Colloquium on Paratuberculosis (Riviera Maya, 2018), 24th Meeting of the International Society of Electrochemistry (Merida 2019), 5th Latin American Congress on Controversies in Diabetes, Obesity and Hypertension (Mexico City, 2019), and the 11th Congress of the World Society of Reconstructive Microsurgery in Cancun 2021, to name a few examples. 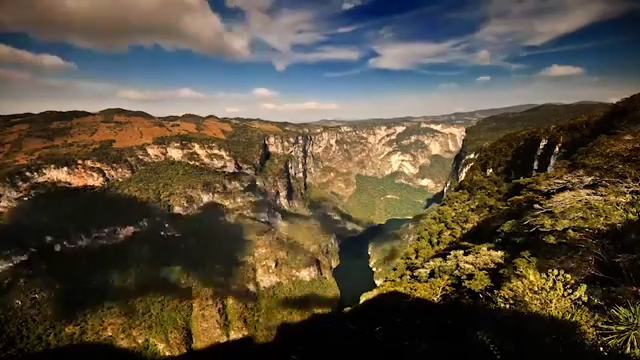 As part of this initiative, the Mexico Tourism Board developed a toolkit to provide each ambassador with pertinent information and contacts to support in bringing visitors from the select ambassadors’ respective industries. The Economic Cluster Perspective program serves to diversify the demand across different destinations around the country, not only based on their attractions or capacities, but also on their industry development across diverse sectors such as Aerospace, Automotive, Renewable Energy or IT. As a result of this initiative, the Mexico Tourism Board is launching a pilot regional program in Queretaro, Aguascalientes, and Leon. The Client Advisory Board consists of a group of leaders from different sectors in the global meetings industry. The Mexico Tourism Board, along with its partner Professional Convention Management Association, created the board to obtain expert feedback on strategic advancements in the industry, including the identification of leading destinations’ best practices and global industry trends. The Industry Bidding Committee (IBC) is in charge of developing guidelines for the collective efforts when competing to attract World Congresses and International Events to Mexico. The IBC defines specific support criteria and is already coordinating private, public, federal and local resources for international bidding. The committee is also implementing a code of ethics to ensure fair competition among host cities and tracking of successful bids. As a result, there is now a clear process in place to bid for international events. The Professional Certification Programs ensure local companies are adequately prepared to meet the needs of international events and travel groups. Certifications offered by the new organization include Certified Meeting Professional (CMP), Certified Exhibition Manager (CEM) for tradeshow professionals, Certified Incentive Specialist (CIS) for travel suppliers and Certified Association Sales Executive (CASE) or Convention Service Manager (CSM) for corporate market professionals. As the on-the-ground experience is crucial for repeat visitors, the MTB is aggressively investing in skills training for locals throughout the country. This year alone, there are more than 90 additional certified professionals from different destinations and companies in the meetings industry.